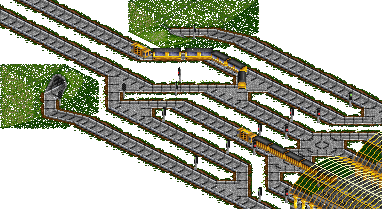 Complex railway design is made possible in the deluxe version because of one-way signals. Just as with one-way streets in real life, a particular railway track equipped with one-way signals at it's entry and exit tiles restricts traffic to run through it in just one direction. Therefore, you achieve high control over the routes individual trains take. And, obviously, high control is the prerequisite for trains to run straight to their destinations and to avoid accidental and costly detours. Some of the railway design features put forward here, particularly those concerning train traffic in the vicinity of stations, require quite intelligently placed signals. Thus, insight into what signals really do is critical. That's why we deal with signals first. Sadly though, that's just whishful thinking. It's not quite as simple as that. In some cases, trains behave quite differently. Let me explain this in detail with the following simplified situation (see picture 1): Suppose we have two trains, both heading for 'Trardinghead East'. This station is accessible both by the eastern route and the western route. The passenger train currently occupies the eastern one. Since we want the wood train to pick the correct route by itself, we've placed two-way signals at the entry tiles of both routes. The train picks the one that's unoccupied and reaches 'Trardinghead East' (in case of the passenger train being broken down presumably earlier than that train). Now, suppose we've forgotten to place two track tiles in the correct way so that the two stations are not properly connected to the routes (see picture 2). 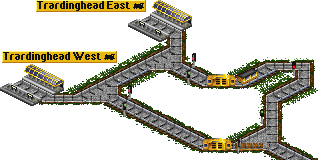 Then the wood train will still pick the unoccupied route, despite the fact that it cannot enter 'Trardinghead East'. 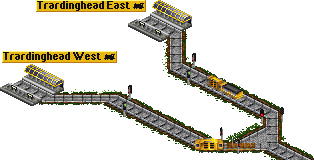 This also holds for the worst case, when there is no tile at all that would physically connect 'Tardinghead East' to the western route (see picture 3). The stupid train still picks the route with the signal showing 'green'. So you might be tempted to draw the following conclusion: 'Let's forget about two-way signals and just use one-way signals all the time!'. And at first sight, you'd be right. After all, it then just follows the route we've planned, right? Well, not quite! What's the use of a train picking a 'correct' route and getting stuck (see picture 4)? Which route is the one we've planned for the train to take in this case, anyway? Well, the answer is quite simple: Even with the one-way signals, it's the train the picks the route all by itself. Although the track layout looks nearly symmetric, it isn't. 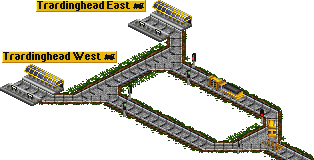 The eastern route to 'Trardinghead East' is shorter than the western one. Take a look at picture 5, where the eastern route has been artificially elongated. Although the signals remain unchanged, the train suddenly chooses the western route. The same happens when we make sure that the signal at the entry tile of the eastern route shows 'green' (see picture 6). Use two-way signals when you want a train to take any green signal and avoid a red one at a junctions. This way, the train keeps on moving, even in the wrong direction. Use one-way signals when you want to force a train onto the shortest route to its destination. This way, the train will stop in front of a red signal, even though there might be a route to the same destination available that's unoccupied, but a bit (or much) longer. Well, that's the rule. But there are exceptions to this rule. For an example, take a look at picture 7. It shows part of the track layout I once developed for stations. The details are not important though, just notice the long, yellow arrow. It indicates the route that trains are supposed to take when leaving the station northbound. The passenger train already took that route, but hasn't left the section of track. Therefore, signal A still is 'red'. The goods train, also leaving the station northbound, picks a different route (via signal B, which is 'green'), although it clearly leads away from the train's destination. This may be in part due to fact that the correct track bends to the right, then to the left, then to the right again and 'looks longer', in part because the goods train can now leave the station on a straight route (this is most often encountered at two-way signals. It is the reason why a train chooses a particular route when encountering two apparently 'equal' routes, both with the two-way signals showing 'green': The train just prefers to run on a straight section of track). Two-way signals don't change anything in this situation, because it is their genuine job to let the train pick the track behind the green signal (see picture 8). The only way to work around this problem is to shorten the distance of the first northbound track section to zero, i.e. put two signals on two consecutive tiles, for example two-way signals first, followed by one-way signals (see picture 9). The goods train now 'feels' the one-way signal behind the first two-way signal and correctly starts leaving the station northbound. So with two signals, you get exactly what you want: The train encounters a green signal and picks the correct route. In the unlikely event that the previous train's last car is right between the two signals while the following train has to make the decision where to go, it again choses the wrong route, of course. If you want to make sure that this happens even more seldom, replace the first two-way signal by a one-way signal. You now have two one-way signals on consecutive tiles (see picture 10). Picture 11. At the entry of multiple-track stations, one-way signals are the wrong choice. So, again the question: 'Why not forget about two-way signals?' Well, they are vitally important at the entry of multi-track stations where they make sure that incoming trains choose an unoccupied track. If one-way signals where placed there, the disaster depicted in picture 11 would happen. One final word about the two rules concerning one-way signals and two-way signals mentioned above: I stated 'Use one-way signals when you want to force a train onto the shortest route to its destination.' Unfortunately again, for TTD trains, a particular route isn't short any more as soon as the trains have to climb hills or ramps to bridges. This also holds for short-cut routes where the trains have to change to a level below alternative routes.